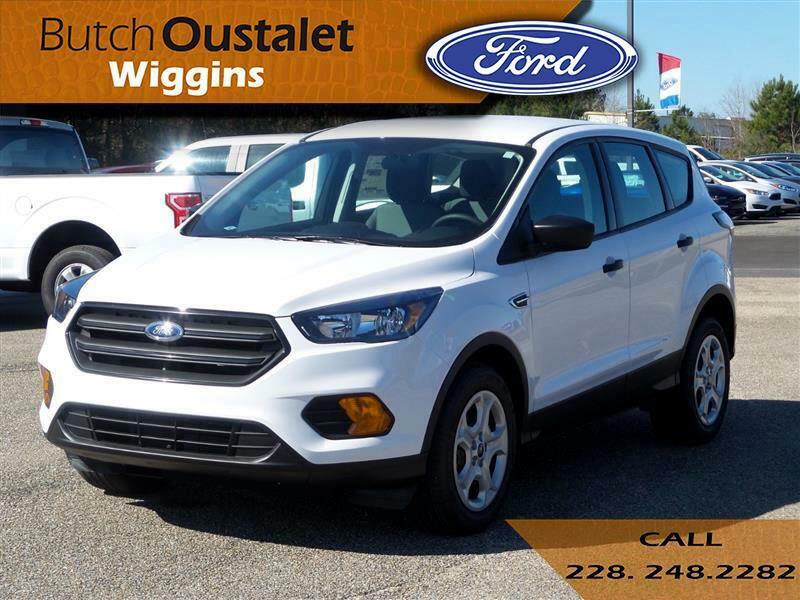 New 2018 Ford Escape S for Sale in Wiggins MS 39577 Butch Oustalet INC. The 2018 Ford Escape is a capable SUV. It has versatile seating/cargo combinations. And it’s engineered to deliver the performance your lifestyle requires. You could say the Escape is one smart SUV. It has several driver-assist features that make driving easier. It includes available features such as the Safe and Smart Package, SYNC 3 and FordPass, and more. You want to carry lots of cargo? No problem. The rear seats fold to provide up to 68 cu. ft. of cargo capacity. Accessing the rear of the vehicle is also a breeze, thanks to an available hands-free, foot-activated liftgate. And to help you while slowly backing up the vehicle, a rearview camera is standard and a Reverse Sensing System is available. Depending on the model you choose, you have a 2.5L I-4 with intake variable cam design, a 1.5L turbocharged EcoBoost engine, or a 2.0L Twin-Scroll EcoBoost rated at 245hp.